Best all round performance of the season. On a roasting hot Monday evening Reading produced probably their best all round performance of the season to defeat a good Sonning side by 9 wickets. Reading won the toss and opted to bowl. Aarav opened the bowling and an accurate line and length put the Sonning openers under pressure and forced 2 early run outs leaving Sonning 0 for 2. Sonning gradually recovered with their 2 county players William Hibberdine, and Micael Longridge forming a decent partnership. Good accurate bowling by Sam, Aswyn, Ajmal, and Gaajuran kept the pressure on and meant that it was never easy to score runs. 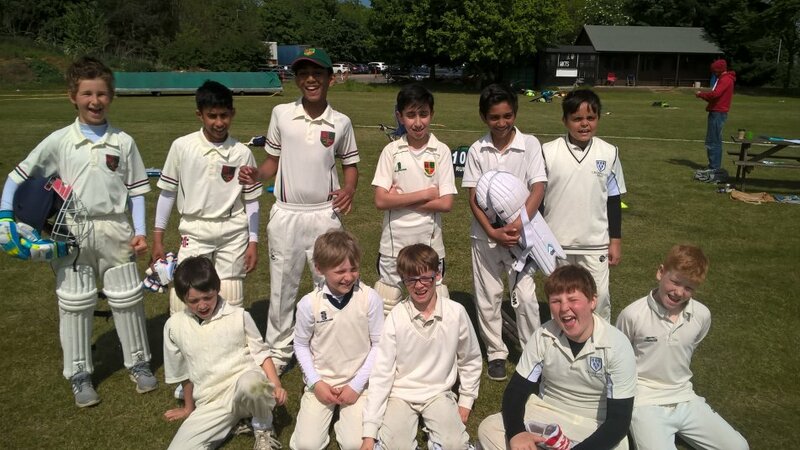 Eventually Michael was beaten by Ashwyn’s pace to be bowled for 13, and Josh earned the prize wicket of the Sonning captain William Hibberdine also bowled for 16. Matthew bowled well to earn the wicket of Sidanth caught by Ashwyn. He could easily have had further wickets if chances had gone to hand. Further resistance followed from Sonning with Max Redding retiring not out on 26, and Alex McLoughlin scoring 15 before Aarav took a good catch off Ashwyn’s bowling. Aarav also had 2 Sonning players out bowled. With a late run out Sonning finished on 109 all out. In reply Reading produced probably their best batting performance of the season. Aarav retired not out on 26. He had a good opening partnership with Ashwyn who was out for 20. Despite struggling with an injury, Gaajuran contributed with an aggressive 27 including 5 fours. He retired not out, Henry and Ajmal then batted with confidence 14 and 6 not out respectively to take Reading to victory. This was a very good performance by the whole team in challenging conditions of extreme heat. Nathan, Manu and Jibran all bowled and fielded well. Well done to all on a great performance and result. Thanks also to Dave for umpiring. Reading CC - Under 11 won the toss and decided to bowl.